Before everyone gets too excited, I must state the bad news first: as of now, it's for Australia only. Subaru Australia has just pulled the sheets off the Forester S-Edition, complete with 260 hp and 256 lb-ft of torque. To make this more bittersweet, Subaru has replaced the old four-speed gearbox with a new five-speed automatic complete with paddle shifters and powered by the WRX's 2.5-liter boxer four. It also has a slightly revised suspension and a few exterior aero dynamic tweaks. There's also a sport interior with a blue tone, Alcantara and leather seats, and a special gear shifter. 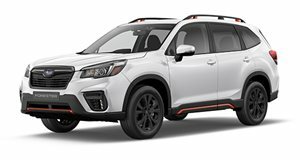 Additions aside, this Forester is everything many have been hoping for with its proper transmission and WRX engine. The big question is whether it'll make it stateside. Our best prediction is a flat "no." However, Subaru is currently making some mid-life changes to the entire Forester lineup and they've strongly hinted that the upgraded five-speed automatic will permanently replace the now historic four-speed unit. The price for the S-Edition certainly isn't cheap with a price set at $50,990 AUD - that's nearly $51,650 USD when converted at the latest exchange rates. In reality, US pricing would likely be some $10k less, at least. It’s traditionally been one of the SUV kings – but can the current Subaru Forester still reign supreme?